Survival following ovarian cancer diagnosis is generally low; understanding factors related to prognosis could be important to optimize treatment. The role of previously diagnosed comorbidities and use of medications for those conditions in relation to prognosis for ovarian cancer patients has not been studied extensively, particularly according to histological subtype. 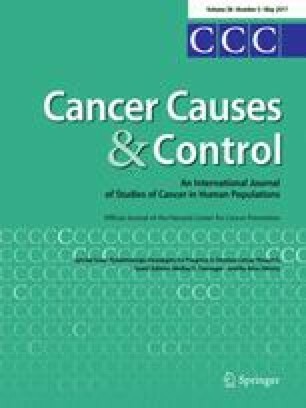 Using pooled data from fifteen studies participating in the Ovarian Cancer Association Consortium, we examined the associations between history of hypertension, heart disease, diabetes, and medications taken for these conditions and overall survival (OS) and progression-free survival (PFS) among patients diagnosed with invasive epithelial ovarian carcinoma. We used Cox proportional hazards regression models adjusted for age and stage to estimate hazard ratios (HRs) and 95% confidence intervals (CIs) overall and within strata of histological subtypes. History of diabetes was associated with increased risk of mortality (n = 7,674; HR = 1.12; 95% CI = 1.01–1.25). No significant mortality associations were observed for hypertension (n = 6,482; HR = 0.95; 95% CI = 0.88–1.02) or heart disease (n = 4,252; HR = 1.05; 95% CI = 0.87–1.27). No association of these comorbidities was found with PFS in the overall study population. However, among patients with endometrioid tumors, hypertension was associated with lower risk of progression (n = 339, HR = 0.54; 95% CI = 0.35–0.84). Comorbidity was not associated with OS or PFS for any of the other histological subtypes. Ever use of beta blockers, oral antidiabetic medications, and insulin was associated with increased mortality, HR = 1.20; 95% CI = 1.03–1.40, HR = 1.28; 95% CI = 1.05–1.55, and HR = 1.63; 95% CI = 1.20–2.20, respectively. Ever use of diuretics was inversely associated with mortality, HR = 0.71; 95% CI = 0.53–0.94. Histories of hypertension, diabetes, and use of diuretics, beta blockers, insulin, and oral antidiabetic medications may influence the survival of ovarian cancer patients. Understanding mechanisms for these observations could provide insight regarding treatment. AOV study center thanks Jennifer Koziak, Mie Konno, Michelle Darago, Faye Chambers, and the Tom Baker Cancer Centre Translational Laboratories. The Australian Ovarian Cancer Study Management Group (D. Bowtell, G. Chenevix-Trench, A. deFazio, D. Gertig, A. Green, P. Webb) and ACS Investigators (A. Green, P. Parsons, N. Hayward, P. Webb, D. Whiteman) thank all the clinical and scientific collaborators (see http://www.aocstudy.org/) and the women for their contribution. The German Ovarian Cancer Study (GER) center thanks Ursula Eilber for competent technical assistance. A.N. Minlikeeva was supported by National Cancer Institute (NCI) Interdisciplinary Training Grant in Cancer Epidemiology R25CA113951; J. L. Freudenheim was supported by National Institute of Health (NIH)/NCI (2R25CA113951); G. Friel was supported by NIH/NCI (R01CA095023 and R01CA126841); K.H.Eng was supported by NIH/NLM (K01LM012100) and the Roswell Park Alliance Foundation; J.B. Szender was supported by 5T32CA108456; B.H. Segal was supported by NIH (R01CA188900); K.B. Moysich was supported by NIH/NCI (2R25CA113951, R01CA095023, R01CA126841, P50CA159981) and the Roswell Park Alliance Foundation; AOV was supported by the Canadian Institutes for Health Research (MOP-86727); AUS was supported by U.S. Army Medical Research and Materiel Command (DAMD17-01-1-0729), National Health & Medical Research Council of Australia (199600 and 400281), Cancer Councils of New South Wales, Victoria, Queensland, South Australia, and Tasmania, and Cancer Foundation of Western Australia; CON was supported by NIH (R01-CA074850 and R01-CA080742); DOV was supported by NIH (R01-CA112523 and R01-CA87538); GER was supported by German Federal Ministry of Education and Research, Program of Clinical Biomedical Research (01GB9401), and German Cancer Research Center; HAW was supported by NIH (R01-CA58598, N01-CN-55424, and N01-PC-67001); HOP was supported by the Department of Defense (DOD): DAMD17-02-1-0669 and NIH/NCI (K07-CA080668, R01-CA95023, P50-CA159981, and R01-CA126841); JPN was supported by Grant-in-Aid for the Third Term Comprehensive 10-Year Strategy for Cancer Control from the Ministry of Health, Labour and Welfare; LAX was supported by American Cancer Society Early Detection Professorship (SIOP-06-258-01-COUN) and the National Center for Advancing Translational Sciences (NCATS), Grant UL1TR000124; MAL was supported by NIH/NCI (R01-CA61107), Danish Cancer Society (research grant 94 222 52), and the Mermaid I project; NCO was supported by NIH (R01-CA76016) and the DOD (DAMD17-02-1-0666); NEC was supported by NIH (R01-CA54419 and P50-CA105009) and DOD (W81XWH-10-1-02802); NJO was supported by NIH/NCI (K07 CA095666, K22-CA138563, and P30-CA072720) and the Cancer Institute of New Jersey; NTH was supported by Radboud University Medical Centre; WOC was supported by Polish Ministry of Science and Higher Education (4 PO5C 028 14, 2 PO5A 068 27), The Maria Sklodowska-Curie Memorial Cancer Center and Institute of Oncology, Warsaw, Poland.